I'm so lucky that I got a quick chance to make some cards while on my vacation. We have a couple of family events (birthdays, etc.) for which I needed a few cards. I thought that I was SUNK until I found out that I would get a few days to "play" with my best friend in her craft room (and all that goes with spending a few days with your best friend of almost 50 years). I'm SO EXCITED that ice cream at Nelson's is on our agenda for tonight. That's always a summer favorite! I made this second card VERY late last night. I couldn't sleep, so I decided to keep creating late into the night; and I came up with this card for a few challenges I found. One is a sketch, and the others I was able to work in with some creativity. Again, you've just GOT to love October Afternoon. It makes card-making SO easy and fun. How bright and cheerful is this simple card? Simon Says Stamp Wednesday Challenge Blog - Simon Says "Furry Friends"
Stamp and Create Challenge Blog - Patterns (I absolutely LOVE using lots of great patterned papers together). 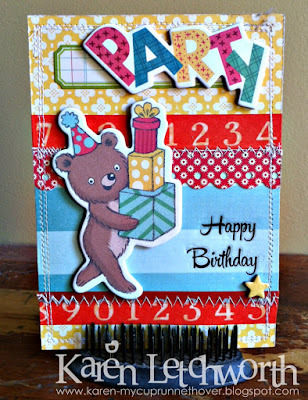 Craftin' Desert Divas Challenge Blog - Craft It Up, Link It Up/Birthday Linky Party - This card is just perfect for this challenge. I would LOVE to win myself more of Craftin' Desert Diva's AMAZING stamps. LOVE them! Have a great week, my sweet and creative friends. What fabulous card, love the stitching and the cute bear. Thank you for joining us at Simon Say Stamp Wednesday Challenge. I love the colorful mix of patterns in this fun birthday card. I hope you are getting lost of rest during your vacation. Blessings! This card is so happy and cheerful! Lovely to look at! Thanks for playing with us at CDD Linky Party. Hope you had fun and enjoy your vacation! Oh my gosh this is just really cute!! Love the stitching too! 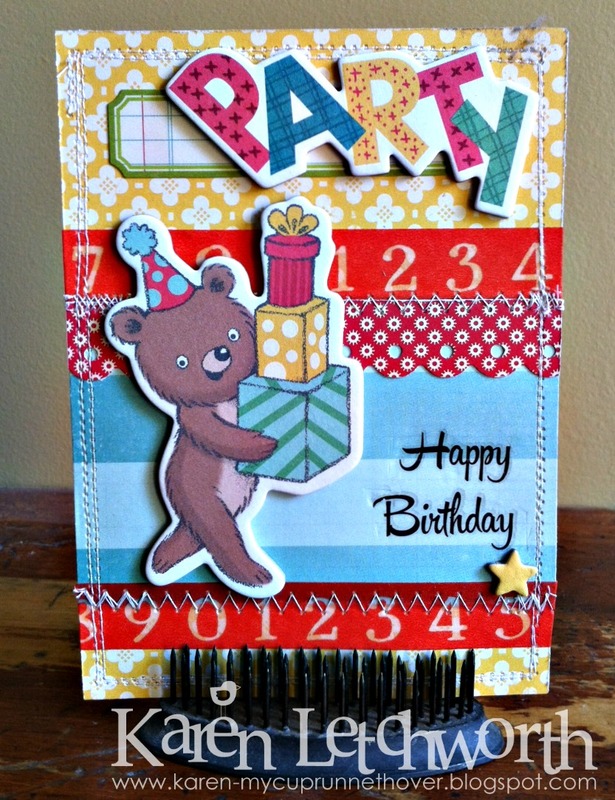 Thanks for joining us at Craftin' Desert Diva's Birthday Linky Party! What a fun card! i I love the stitching! This is ADORABLE and was so worth your late night crafting!! Thanks so much for joining us at Sketch Saturday this week! Oh this is wonderful!! Thanks so much for playing along at CCCB!! This is so adorable and cute! Thanks so much for joining us this week at CCCB!